Hobbit, aka Last Bad Habit, is a 3 year old white & red male born February 12, 2016. His sire is Shonn and his dam is Glossy Glow. Hobbit has 63 races on record in Arkansas and Texas from 2017 to 2019. He should not live with cats or small dogs. Hobbit is tall for a Tolkein hobbit, but does have hairy feet! 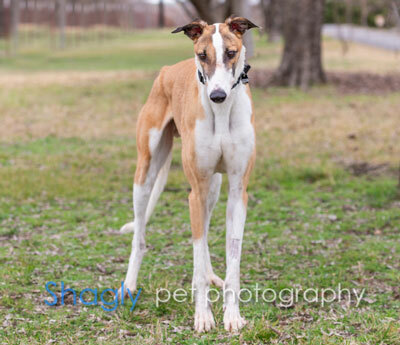 When you meet Hobbit, you would never guess that he’s been a race dog besides his beautiful athletic build. He’s very mellow and loving, and all he wants to do is to please you and be close to you. He learned to go outside to do his business in just a few days, the same time it took him to master the stairs. 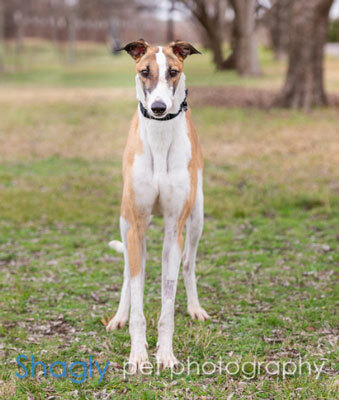 He walks very nice on a leash and overall has adjusted to couch potato life very quickly! We go for walkies twice a day and he likes to walk at his steady calm speed. If you’re a power walker or runner, you won’t get an exercise buddy out of Hobbit. He’s motto is – I’ve done my fair share of going fast; your turn now! Every now and then he likes to sprint on the backyard, and after that he’s ready to take a nap... a true greyhound! Hobbit has not shown too much interest in other dogs, greyhounds or non-greyhounds but small dogs on the other hand are a bit too interesting to him, so he’d be better off in a family without small animals. He loves people and goes tail wagging to meet everyone, but because of his size and strength and tendency to jump when he gets excited, he would prefer a home with older children. He loves to give kisses and follow you around and does not understand at all what personal space means. He sleeps well in his crate or in his dog bed, but when left alone he’s been crated as he seems content there. He has been crated for up to 6 hrs and has done well. Hobbit is quiet ,and I have never heard him barking, so he’s not kind of a dog that will bother your neighbors. He really is a charming beautiful soul and the little heart on his side is a sign that he has lots of love to give. His future forever family will be privileged and lucky to have him as their forever loving pet.